"We're being hunted!" It's here! At an event in Los Angeles on November 1st, Universal unveiled the first teaser trailer for James Wan's highly anticipated Furious 7, the seventh movie in the Fast and Furious franchise. This one stars Paul Walker, in one of his very final roles after his tragic death, as well as just about everyone else: Dwayne Johnson, Tyrese, Vin Diesel, Michelle Rodriguez, Lucas Black, Kurt Russell, Jason Statham, Elsa Pataky, Jordana Brewster, Djimon Hounsou and Tony Jaa. This one looks even better than the last one, packed with some insanely awesome can't-believe-they-did-that car action (check this out) and I really can't wait to see it, to be totally honest. Fire it up below! "One last ride." 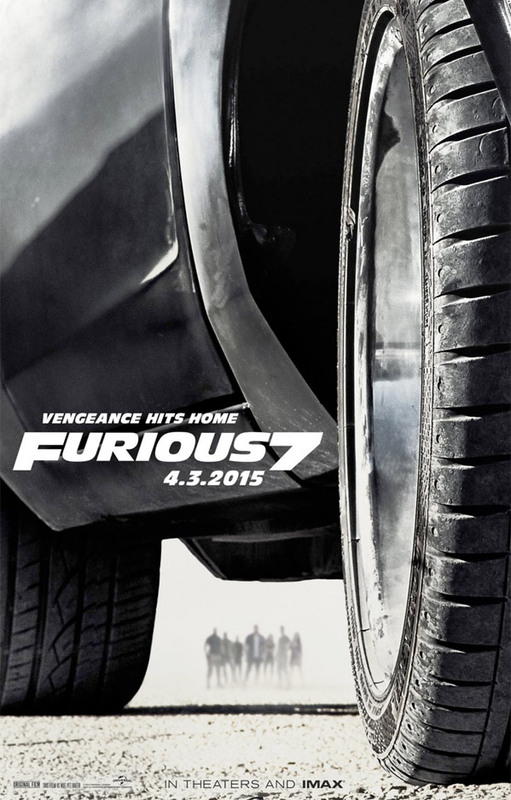 For more updates on Furious 7's release coming spring 2014, follow Fast & Furious on Twitter or Facebook. James Wan looks like he is going to hit a home-run with this one. Can't wait to see it. I think you're right. It looks like he took everything we loved about the first six movies and then upped the ante. What next for Furious 8? UFO's? Transformers? Really? you didn't like what you saw here? Well I understand people who liked the first one and don't like this but if I recall correctly the 2nd, 3rd and 4th movies blew chunks. The last two brought life back into the hollow shell that was left of the series. So anyone expecting another "first movie" is in the wrong place. It's not that they're worse, that they're wackier. 5 and 6 are awesome. This is just so over the top :/ Meh. The first movie was actually good. I hope they at least give an emotional farewell to Walker. If these movies are too over the top for you, I don't want to hear that you are a fan of superhero movies. Like that comparison makes any sense...I don't love superhero movies, but I do enjoy them and for the most part are miles away from anything this franchise has ever delivered. And I'm sorry but when a superhero movie seems more plausible than a sequel to a movie that started with just some guys street racing, maybe there's a problem. I'm just saying that, if you are able to suspend your disbelief for a reality where super suits, super-humans, and super-powered aliens from other planets/galaxies exist but you CAN'T accept a reality with a few over the top car stunts, maybe there is a problem. But it isn't with these movies, it is with you. Iron Man is more plausible than a car with a parachute? I'm not debating either being particularly realistic. I like superhero movies a hell of a lot more than the Fast franchise(which I obviously enjoy as well) but if we are going to open up this 'well this is just ridiculous' can of worms...you can't argue that the superhero genre inherently is one of the most ridiculous things ever, and some over-the-top car-fu, as unrealistic as it is, is still more realistic than aliens and flying robot suits. I'm not criticizing your right to an opinion, just the logic behind it. If you think action movies are supposed to be a 100% reflection of reality, then I have some sad news for you. No movie is "Real life", every single movie operates under its own rules. Comedies go way more ridiculous and have people that are far more stupid than anyone in real life would be, action movies have people that are stronger, faster, never break bones when jumping off of roofs or through windows or anything like that. It is all hyper-reality, horror films, comedies, action films, even romance films....it's all amplified. So the logic of 'Well, the Fast and Furious franchise isn't as over the top as superhero films, so it isn't allowed to be unrealistic AT ALL' is just utterly ridiculous. Yes, clearly I'm the one that needs to grow up. Screw me for having a neatly elucidated opinion. I couldn't help my laugh at the opening scene of this trailer. These movies keep getting worse and worse with the type of stunts they try to pull off. I don't think I've enjoyed any F&F movie after the first one, but that's just me. Looks fun and I was touched and sickened by Dom's family lines. It's very interesting, kinda crazy, to see how far the FF franchise has come with this movie compared to what the first was about. Like if someone told me what would be happening now, when FF1 came out, I'd find it hard to believe. This looks totally awesome! Man, I remember as a teenager still going to the movies to watch the first one and never really liked them after but the last one was really fun. Crazy to think how long these movies have been around for. This looks better than the last one. Will see. Unfortunately, you can't really notice the change of direction, since the whole production team is unchanged. Well, that CGI looks pretty disgusting...Still hoping for a good movie, Fast 6 was a bit of a let down after the incredible Fast 5. I hear there's a half our scene where Vin Diesel stands in line at the DMV waiting to register his new hot rod....then there's another long scene where Michelle Rodriguez is on the phone for an hour with the car insurance company after a fender bender. Much excitement. So is this the last one ? I believe so. There's still talk of Johnson's character having a spin-off, but I believe this is the last ride for the F&F cast/family. Man i cant wait for this movie to come out. Its going to be raw..